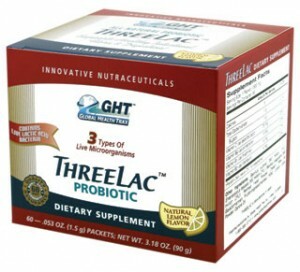 Threelac contains 3 probiotic strains in a sachet. It needs to be mixed with water or other fluid and consumed. The 3 strains used in its formulation are 500 million CFUs of Bacillus subtilis, Bacillus coagulans, and Enterococcus faecalis each (1.5 billion CFUs total). Threelac has no dyes or artificial colors. Threelac doses aren’t protected by a delayed-release mechanism but some probiotic strains are acid-resistant. It has FOS prebiotic although the amount is not disclosed. Prebiotics Prebiotics are a food source for probiotics. Threelac contains prebiotic. Number of Probiotic Strains There are thousands of different kinds of organisms living in your colon. Some are more helpful than others.Some probiotic organisms are more helpful that others. Threelac has 3 strains. Number of CFUs (in billions) CFU stands for Colony Forming Unit which is representative of the number of organisms in the product. Threelac has 1.5 billion CFUs total for its 3 strains. Enteric Coating Digestive juices may destroy many probiotic organisms. An enteric coating or delayed-release system that releases probiotics in the colon may help keep them alive. Unfortunately, Threelac is a drink mix and has no protection mechanism for its probiotics. It relies on the natural acid-resistance of the individual probiotic strains. No artificial coloring or dyes Threelac does not have any artificial dyes or coloring. CFU stands for Colony Forming Unit which is representative of the number of organisms in the product. I use this product and find it powerful for controlling candida symptoms that have plagued me for years. Best of many programs I’ve tried.